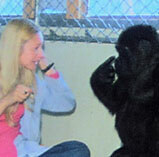 When Dr. Francine “Penny” Patterson began teaching Koko sign language, it soon became apparent that gorilla hands were shaping the language in a unique way. But as A CONVERSATION WITH KOKO dramatically shows, the difference wasn’t surprising, for gorilla hands are shaped quite differently than a person’s. In particular, gorilla thumbs are smaller than ours, meaning the apes can’t make some signs the way a person would. As a result, Koko has developed what Patterson calls Gorilla Sign Language, or GSL. GSL isn’t the first new sign language. People in Europe, Asia, and the Americas have all developed their own sign languages, just as they have created their own spoken and written languages. And just as written English is built from an alphabet of 26 letters, ASL is built from a collection of fluid, expressive gestures. The meanings of some signs are clear even to those who don’t speak ASL. Putting fingers to your mouth, for instance, refers to eating, while a pantomime of fluttering fingers means rain. Other signs, however, are much more abstract and may have no obvious relationship to their meaning. There is no obvious reason, for instance, why a particular finger twisted at the cheek should mean “candy.” But just as poets mold English into surprising new combinations and creative kids invent entire new slang vocabularies every year, ASL users are constantly evolving their language, developing new signs or stringing old ones together in startling new ways. That people can teach each other new ASL signs isn’t surprising. But the idea that people could teach a gorilla to sign surprised many. Koko’s quick grasp of ASL, however, may have been aided by the fact that wild gorillas already appear to have their own form of sign language. Researchers have detected a whole suite of hand gestures and body postures the animals use to communicate; to Koko, learning ASL may seem like learning a dialect of her own existing language. And just as humans often adapt foreign words to their own language, Koko appears to have adapted ASL signs to fit her own needs — and the shape of her hands. Just as bilingual speakers have created mixed languages like “Spanglish” (Spanish and English), Koko apparently has created GSL, a mixture of ASL and her own gestures. But don’t look for GSL at your local zoo any time soon. So far, only Koko and Michael can use or understand it. And it is not known if Koko or another gorilla parent can teach it to a baby. ASL, in contrast, is the fourth most used language in the United States, with millions of speakers — all of whom are aided as they speak by slightly larger thumbs!